We got really excited yesterday when we heard there would be a miniaturized Galaxy S III coming. Our excitement didn't last long, because a second rumor hinted that the specs wouldn't be anywhere close to the original S III. We held out some hope that the second rumor might be wrong. Sadly, it wasn't. 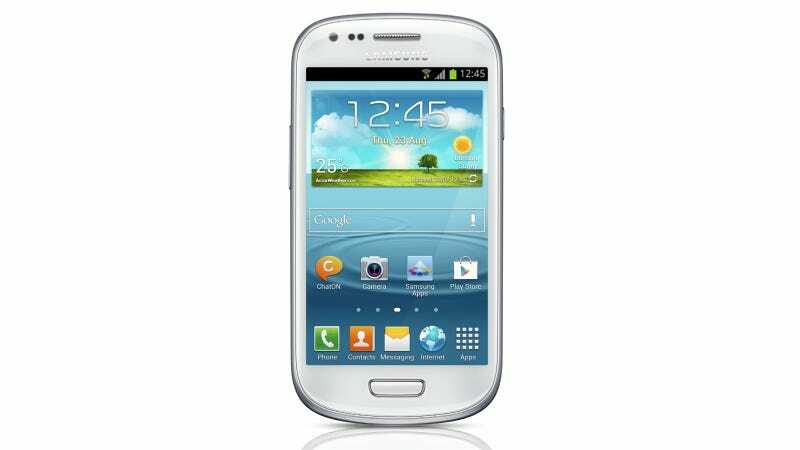 The Galaxy S III Mini will have a 4-inch screen at 800x480 pixels. That's 233 PPI (pixels per inch), down from 306 PPI on the original galaxy. The processor is a dual-core unit clocked at 1GHz, down from the dual-core S4 on the U.S. S III which is clocked at 1.5GHz, and down even further from the quad-core 1.4GHz Exynos processor on the international version. RAM drops from 2GB to 1GB, the battery drops from 2,100mAh to 1,500mAh, and the camera drops from 8MP to 5MP. Damnit. With that list of changes you might wonder why it bears the Galaxy S III name at all. Simple. The Galaxy S III has been selling like hotcakes, and this lesser phone (in every way) wants to ride its coattails. The one advantage here is that the Mini will be launching with Android 4.1 (Jelly Bean) out of the gates. I mean, cool, but that's probably coming to the regular Galaxy S III soon anyway. You're better off doing some hand-yoga and buying the bigger one.